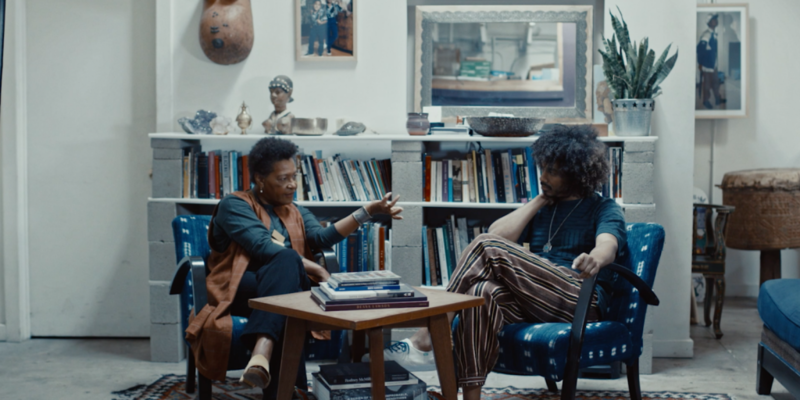 When two people with talents and passions as wide-ranging as those of the artist Carrie Mae Weems and Random Acts of Flyness creator and Space Jam 2director Terence Nance get together, the conversation can go off the rails, but always in a good way. Presented in collaboration with Swizz Beatz, UTA Artist Space and Lyft Entertainment, directors Sing J. Lee and Sylvia Zakhary produced a sit-down between Weems and Nance in which they open up about everything from establishing identity and community through art to the role gender has played in Weems’s four-decade long career. “I knew from a very young age that I wanted to be an artist,” Weems tells Nance, claiming that her lifelong bond to existentialism started at the age of eight; she has been searching for blackness in American popular culture ever since. While recounting an anecdote of flipping through the newspaper every weekend only to be stunned by “no representation of blackness in any form,” Weems reflects upon how she believes institutions will respond to the unavoidable influx of black representation in the arts and popular culture in the future. She posits that, in the very least, the optics of being a contemporary institution that does not include black art don’t look so good. The undervaluing of women and minorities is negotiated within the work itself, Weems says, and institutions (museums, universities, galleries) fear irrelevancy. That fear is what will move the needle towards greater representation. Weems and Nance also unpack the importance of appropriately lighting a photographic subject with darker skin (a feat Weems mastered with her canonical Kitchen Table Series), the power dynamics at play between artist, subject, and institution, and Weems’s later-in-life realization that the number one supporters of her work have never been men. “When I really looked across the landscape of my life and I realized that very few men had ever really supported me, it blew my mind. I couldn’t believe it,” the artist tells Nance. “They’ve never really supported me. They might take my ideas, they’ll use my ideas, but they will not use me,” she says.